It was mostly red for YTD 2018 and all green for January 2019. The recent volatility also brought the 1-year standard deviation more in line with the longer-term average. 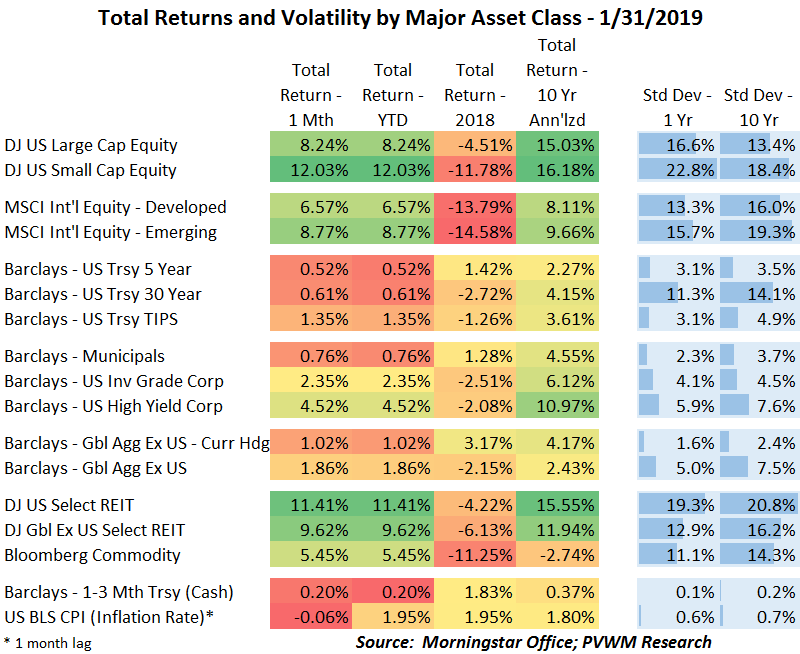 US equities had a very strong January, with small caps leading the charge, as seen in the table below. In addition to the change in the Federal Reserve stance on future rate hikes, there were positive – or at least less negative – developments in ongoing trade negotiations and continued earnings strength of companies from latest earnings reports. At the sector level, all were positive with industrials, energy and real estate leading the charge with +10% monthly returns. Financials even rebounded despite the dropping interest rates. International equities also rebounded nicely, with both developed and emerging markets having similar returns. These markets have a deeper hole to dig out of than the US equities, though much of their 2018 damage was done sooner and the trend the last few months, especially in emerging, is favorable. Commodities also were strong as the energy complex snapped back. As mentioned, a big driver was the change in outlook from the Federal Reserve on future rate hikes. At the December FOMC meeting the direction was an expected two more rate hikes in 2019 and continued balance sheet reduction. Starting with speeches in early January and then confirmed with Fed statement and press conference, the Fed will be more patient in 2019. While the Fed Funds futures market has priced out any rate hikes, I believe the Fed won’t be too patient in the face of any rising inflation. It has been more muted than I and others expected, but still bears watching.